Story: On November 15, 1959, the brutal murder of a family in a small Kansas town sent shockwaves through the nation - and captured the attention of one of the most distinctive minds of our time. One-of-a-kind author Truman Capote was sent to Kansas to pen an article about the crimes for The New Yorker magazine. He ended up writing one of the most celebrated books of the century. 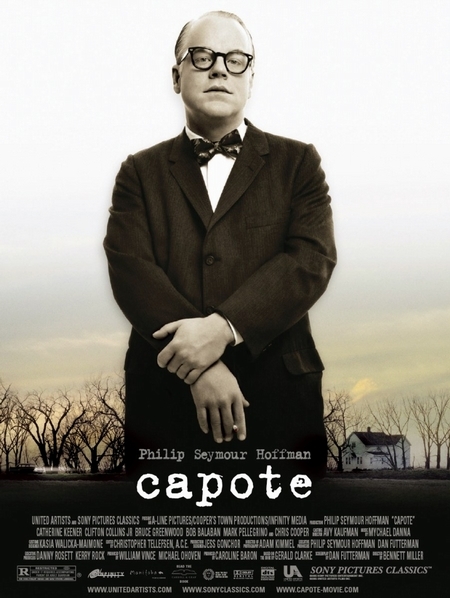 Capote follows Truman Capote (Hoffman) on his odyssey to create the landmark bestseller In Cold Blood. With signature style and mordant wit - and his friend Harper Lee (Keener) in tow - Capote attempts to charm the locals and work his way into the story behind the murders. He's soon shocked, however, to find himself forming a friendship with one of the killers, Perry Smith (Collins). As the book nears completion and execution day approaches, Capote finds himself torn in directions he never anticipated and is forever changed by his experiences.